Boom! Studio’s exciting Shattered Grid event is reaching its climax, and while we eagerly await the continuation, previews for Power Rangers Shattered Grid Issue #30 was just released viacomicfrontline. In addition, two variant covers exclusive to legendcomics-games were sighted online too. One cover references The Amazing Spiderman Issue # 238 while the other cover is a reference to the theatrical poster for the movie Dragon Ball Z: Fusion Reborn. Of course, there will be spoilers ahead so make the jump at your own risk! 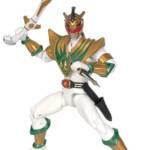 First Look- Power Morphicon Exclusive Legacy Lord Drakkon Figure! A special preview has been put online for this years’ Power Morphicon exclusive figure! Power Morphicon is currently scheduled for August 17-19 2018 in Anaheim, California! For those interested in attending or picking up this unique figure, feel free to check out the Official Power Morphicon Website for further details! Discuss on the Tokunation Forums› Views: 2391 › Credit: PowerRangersNOW! SHATTERED GRID- Boom! 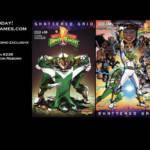 Studios MMPR Issue 26 Preview Pages Online! A few pages from the next issue of BOOM! Studios Mighty Morphin Power Rangers comic series event Shattered Grid have been posted online thanks to SyFy Wire! Be warned, the preview pages contain SPOILERS for the previous issue- and possibly for the rest of this special event! This issue of the Shattered Grid comic event will be released on Wednesday, April 18 2018! Stay tuned to TokuNation as we keep you up to date on this incredible adventure! Power Rangers Shattered Grid Prelude Video Released! Jason David Frank has just posted to his personal youtube account, a surprise live action video prelude to THE comic book event of the year. Shattering the world of the Power Rangers, and our own expectations, this is Shattered Grid! Shattered Grid, the event that will effect every Power Ranger in the multiverse, begins next Wednesday March 28th! Be sure to hit up your Local Comic Shop that day to grab your copy of the issue. 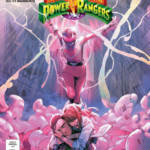 It all begins in Mighty Morphin Power Rangers #25 from Boom! Studios.